In his speech at the December PES Congress, Frans Timmermans, the current lead candidate for the European Socialists, defined these elections as being about ‘the soul of Europe’. Eurosceptic forces made important gains in the 2014 election and are set to increase their seat share again in the upcoming one. Overtly pro-European forces also seem set to make important gains in electoral support, and new pro-European forces are also forming (e.g. the Italian More Europe party, or the pan-European Volt). As overt position-taking over EU institutions and powers starts to even up (while in the past it was monopolised by anti-EU actors), we may be finally entering the era of EU political contestation. Rocked by forces that want, respectively, less and more Europe, the 2019 election results have thus the potential to define the nature of the EU for years to come. 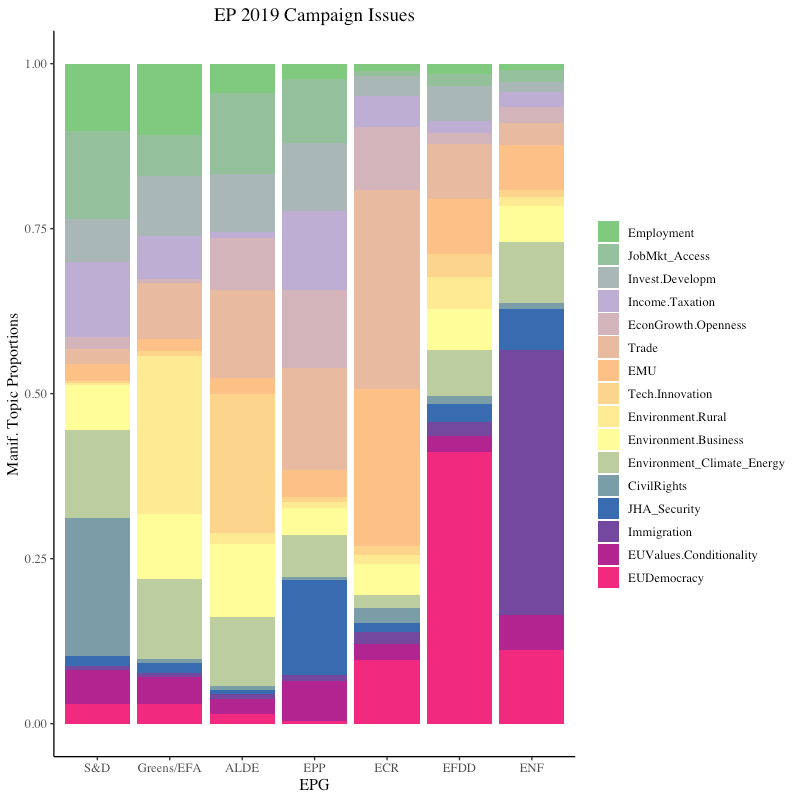 The member states are still responsible for the running of European Parliament (EP) elections, but national parties (especially the more established ones) will signal their Euro-party or European Party Group (EPG) affiliation during the campaign. EPGs are ‘umbrella organisations’ joined by ideologically-similar national parties to coordinate their EP activities. Some EPGs are well-oiled machines, like the European Peoples’ Party (EPP) and the Socialists and Democrats (S&D, formerly PES) – founded, respectively, in 1976 and 1973. Others are of very recent establishment, such as the Europe of Nations and Freedom (ENF) group, created by radical right Eurosceptic parties in the aftermath of the 2014 elections. Being part of an EPG has its advantages: it makes it easier for a national party to get rapporteurships, speaking time and committee chairmanships (as well as funding for administration/staff). To give an overview of the 2019 policy priorities of the main EPGs I have collected some recent party literature from their official websites. Not all EPGs have released their official 2019 manifestoes as of now. So I complemented the set of documents by using the most recent party congress resolutions or current programme sections in the official websites. The European Left (GUE/NGL) is absent from this analysis since the European left is currently divided and no clear manifesto/platform section was found on their website. I carried out an LDA topic model analysis on the documents. The algorithm identified 16 key topics in the corpus. Economic (especially trade and employment policy) and environmental policy topics are quite prominent features of European parties’ current discourse. There is also some notable discussion (albeit uneven) around the EMU and the reform of EU institutions. Different EPGs of course place different emphasis on each issue. Figure 1 below depicts the likelihood that each EPG’s programme relates to any given topic. Note: Party platforms as of 6 February 2019, downloaded from official websites. The list of European Party Groups is as follows: Progressive Alliance of Socialists and Democrats (S&D); The Greens–European Free Alliance (Greens/EFA); Alliance of Liberals and Democrats for Europe (ALDE); European People’s Party (EPP); European Conservatives and Reformists(ECR); Europe of Freedom and Direct Democracy (EFDD), Europe of Nations and Freedom (ENF). Civil rights issues are mostly ‘owned’ by the S&D and almost never picked up by other groups. Similarly, immigration has clear urgency for the ENF group – unsurprisingly, since it is mainly composed of radical right populist parties – but very low salience for all other groups. Overall, the S&D prioritises issues of employment, income and taxation, and aims at imbuing European economic policy with a more ‘social’ dimension. The S&D also emphasises climate and environmental issues, though not to the same extent as the Greens/EFA. The Greens are predictably running on a clear environmental platform, and also on an employment / ‘social Europe’ one. The liberals (ALDE) also discuss employment (especially by adopting the ‘job market access’ rhetorical dimension), income policy and the need for investment. They are however more interested than the preceding groups on trade and economic growth/innovation. They share a concern for environmental policy (discussed mainly in relation to businesses and climate). All in all, ALDE’s programme appears almost exclusively focused on the economic dimension. The EPP also overwhelmingly talks about economic policy – and particularly about economic growth and trade – but it places a bit more emphasis on issues of law and order such as JHA/Security and EU Values, rule of law and foreign relations. The European conservatives’ (ECR) rhetoric is heavily centred on trade and on economic growth, as well as on the common currency and EU institutional reform. The European Party of Freedom and Direct Democracy – led since 2014 by UKIP and the Italian Five Star Movement – is predictably very concerned with the importance of redressing EU institutions and their democratic flaws. These issues have been also indicated as priorities by the Five Star Movement in its current quest for new allies. Finally, the Europe of Nations and Freedom group, as mentioned above, prominently discusses immigration, though it also features discussions on the common currency and EU democracy. We see a clear divide between non-Eurosceptic (S&D, Greens/EFA, ALDE, EPP) and Eurosceptic groups in their emphasis of economic vs. non-economic issues, with the former mostly discussing economic and environmental policy proposals and the latter focusing on EU institutions or monetary union reform and cultural issues (such as security or immigration). The battle over the democratic soul of European institutions is, unfortunately, still very much one-sided in terms of salience. However, it is heartening that the Greens and the other mainstream EPGs (except, sadly, for the EPP) are paying attention to the issue and putting forward their counter-proposals. Upon analysing each party platform, it appears that the centrist, mainstream party groups (ALDE, S&D) mostly emphasise piecemeal reforms such as increasing transparency, augmenting EP powers and creating participatory/deliberative opportunities for citizens (which are aims also shared by the Greens); while the Eurosceptic camp (ENF, ECR and EFDD) believe democracy can only lie at the domestic level and call for a return to strong intergovernmentalism, though (in the EFDD case) there is also an eagerness to introduce direct/participatory democracy avenues. The Greens are putting forward some brave proposals on this issue, making a strong case for full supranational democracy and for moving away from national vetoes, to reduce the policy failures caused by the EU’s intergovernmental, territorial processes. Finally, the S&D proposes transnational electoral lists, which betray a similar interest in transnational democracy. It appears that there might be a consensus on introducing deliberative/participatory fora, as many political forces seem to support this. This might be an important first step from the future parliament in the direction of developing EU-level political contestation and transnational democracy with it. 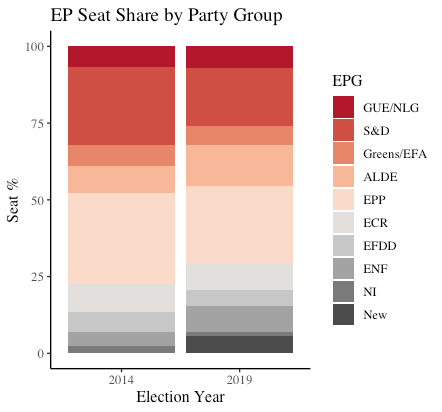 In terms of expected electoral results, Figure 2 below depicts the share of seats won by each EPG in 2014 and the projected percentage of seats in the future Parliament (2019-2024), using pollsofpolls.eu. Note: Figures from pollofpolls.eu. Last accessed 6 February 2019. The 2019 estimates are based on polls that refer to national elections, not European ones. The vote share of small/anti-establishment parties might thus be underestimated. It is clear that the S&D and the EPP are contracting while Eurosceptic and nationalistic forces (EFDD, ENF and ECR) are increasing their share of the seats. This appears to be driven by the electoral successes of parties affiliated with the ENF (such as Matteo Salvini’s Lega in Italy) but also to the achievements of new parties (the wide majority of which are radical right and/or Eurosceptic). There are also some notable gains made by ALDE, though it may be due to the assumption made by pollofpolls.eu that Macron’s La Republique En Marche will be affiliated with ALDE, which is likely, but still very much in doubt. ALDE is however also set to make quite substantial electoral gains in nine other member states (Ireland, Spain, Germany, Denmark, the Czech Republic, Slovenia, Romania, Estonia and Latvia), while losing some small support only in seven (Portugal, Belgium, Sweden, Finland, Croatia, Bulgaria and Lithuania). Overall, the two mainstream parties (S&D and EPP) are expected to reap 44% of the European Parliament’s seats, down from a clear majority of 55% in the 2014-2019 term. As is evident from the seat projections above, grand-coalition (S&D + EPP) voting, which is in decline, at least since 1999, will be no longer practically possible. In terms of the more common majorities built on the ideological left-right, the left (S&D – ALDE – Greens/EFA – GUE/NGL) will see its share of seats decrease from 47.9% to 45.6% while the right (EPP-ALDE-ECR) is predicted to only slightly reduce its seat share from 47.8% to 47.3%. The right-wing coalition has also further votes available in the radical right region, if it wanted to use them, while the left has no further left-wing space available. If we look at the European integration dimension – another important dimension of EP competition – the Europhiles (S&D, EPP, ALDE, Greens/EFA) still enjoy a super-majority of 63.9% (though down from 70.6% in the previous legislative term). The predicted strong showing of Eurosceptic groups is generating fears that EU decision-making will be deadlocked, obstructing the EP’s capacity to take decisions and potentially increasing national governments’ influence. However, finding a majority in the EP has usually been an ad hoc exercise, in no small part because the EU is not a majoritarian parliamentary regime. MEPs are familiar with perpetual compromise and with shifting majorities. Similarly, the right-wing coalition is not projected to have significantly less clout than it had during the 2014-2019 term (see above), it is simply going to be more dominated by the ALDE group (if the current projections hold, that is). Finally, it is also important to note that Eurosceptic party groups are notoriously incoherent: apart from the ECR, who fares somewhat better, Eurosceptic members rarely vote together or manage to build a party line, whereas mainstream EPGs are more successful in whipping the vote. By way of example, MEPs from the Five Star Movement (currently members of the EFDD group) usually vote together with the Greens and almost never with fellow EPG member UKIP, showing only opportunistic Euroscepticism. Eurosceptics are thus unlikely to form a consistently unified front against policy proposals. Finally, EPGs have a role in the Commission President nomination process, where the grand-coalition proved useful back in 2014. While before Lisbon the nomination of this top executive post was the prerogative of national governments, now it is the EP who formally elects the Commission President. It is likely that the EPG that wins (close to) a majority in European elections will determine who the Commission President is (the Spitzenkandidaten process). Given the absence of clear majorities, or of the possibility of grand-coalition voting, the nomination of the Commission’s President is likely to take longer in 2019: the gains of the Eurosceptic contingent make it difficult for the two mainstream parties – which are the more vocal supporters of the Spitzenkandidaten process and are ready to back each other’s nominee – to command the 353 seats needed for a majority. Similar to the pattern of increasingly lengthy coalition talks in recent domestic government formation processes, the nomination of the new Commission President might suffer significant delays this time around, with the likely consequence that the power of nomination will be practically handed back to national governments. Miriam Sorace is an LSE Fellow in EU Politics at the European Institute. Her research interests include political representation, democratic deficits, voting behaviour, public opinion research, legislative behaviour and European Union politics.